Mega Man ZX Advent, known in Japan as Rockman ZX Advent, is a video game developed by Inti Creates and published by Capcom for the Nintendo DS handheld game console. It is the sequel to Mega Man ZX. 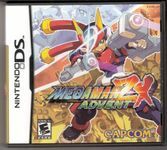 Taking place a few years after the events of the first game, Mega Man ZX Advent follows two new protagonists, Grey and Ashe, as they battle with various enemy "Mega Men", the infamous "Model W", and their own destinies. Source: Wikipedia, Mega Man ZX Advent , available under the CC-BY-SA License.